DID YOU KNOW: Part of every Hair Cuttery service is a FREE consultation! 2. Bring a photo: Stylists are visual, and it's helpful to see colors or cuts that you have in mind. Bring images from magazines or print up looks you find on the Hair Cuttery Pinterest boards. Visit the Get the Look style gallery on Hair Cuttery’s website to see the actual work of our talented Stylists and where they are so that you get the look you ‘ll love. 3. Reflect on the last appointment: Chat about what you liked and didn't like, hair-wise, from the previous appointment. It’s important to let your Stylist know what you don’t like. For example, if you say your bangs were cut too short and show them, then they have a clear understanding of what not to do. Conversely, if you loved a certain shampoo or conditioner or styling product, you can request they use it again. 4. Do some research: Do some research on cutting methods or the color application you may be interested in. This is very important information that will make your hair salon experience go smoothly. You may want “red” hair, but are you considering your current color and what it will take to get to the shade you want? Will the shade suit you? Are you prepared for the color maintenance that comes with red hair? Knowledge is power! 5. Know yourself and your hair: Know what works for your lifestyle. Focus on how much time do you actually spend styling your hair. Do you have the tools to achieve your new look at home? 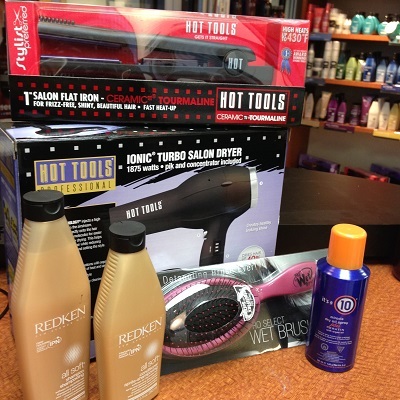 Brushes, flat irons and styling products are important to the final look of your service at Hair Cuttery and to your at-home style maintenance. 6. Discuss the FINAL price: It’s best to know the cost up-front so that there are no surprises at checkout time. There may be additional charges for long hair since more product and time are needed. You may find getting one of our value packages provides more bang for your hard earned buck. You and your Stylist will be clear on all aspects and you can now relax and enjoy your time with us. 7. Trust their judgement: Lastly, trust your stylist. Know that you are in good hands, and they want you to be happy with your hair. We believe in our Stylist abilities so much that we offer a Smile Back Guarantee. Our commitment to you is we will do whatever it takes until you're smiling back in the mirror. Our goal is the same as yours- for you to look amazing and be happy with your hair! With a little prep work and communication, you will help your stylist understand your expectations and get the end results you want. We look forward to your next visit with us at Hair Cuttery!